At the Taj Mahal of training centers, a fast-growing Indian outsourcing company lavishes attention on its recruits. India's Prime Minister Manmohan Singh flew to Mysore in February 2005 to inaugurate Infosys's Global Education Center. The complex, with two heliports, a professional grade cricket stadium (used recently by India's women's national team) and an employee care center equipped with laundromat, medical center and supermarket, spans 315 acres and includes a software development facility and a 162,000 square foot leadership institute. The company's goal is to create an environment for life-long learning. 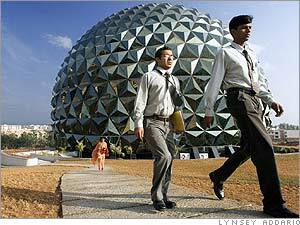 While the center is primarily used by new recruits the company calls 'freshers,' the campus also trains mid-career employees at the Infosys leadership institute.